Modular biomanufacturing facilities are beautiful the way geometric proofs are beautiful. They arise from fundamental elements, and they may proceed—step by step—to diverse conclusions. In the case of modular biomanufacturing, the individual steps consist not of axioms or postulates, but of unit operations such as media preparation, cell culture, purification, compounding/formulation, and fill/finish. Swapping such elements in and out, as needed, gives biomanufacturers the flexibility they need to cultivate diverse product lines, accomplish quick changeovers, and accommodate fluctuating capacity demands. For example, biomanufacturers may substitute “scale out” for “scale up.” That is, they may add parallel production lines instead of expanding the capacity of a pre-existing production line. This kind of flexibility is especially welcome in biologics production, where the future belongs to companies that can consistently generate targeted therapies instead of the occasional blockbuster. To gather more hints about what the future of modular bioprocessing holds, GEN addressed a few key questions to a panel of experts. By the time we present the last of the answers supplied by our panel members, our readers may agree that this article could have ended with the phrase quod erat demonstrandum. 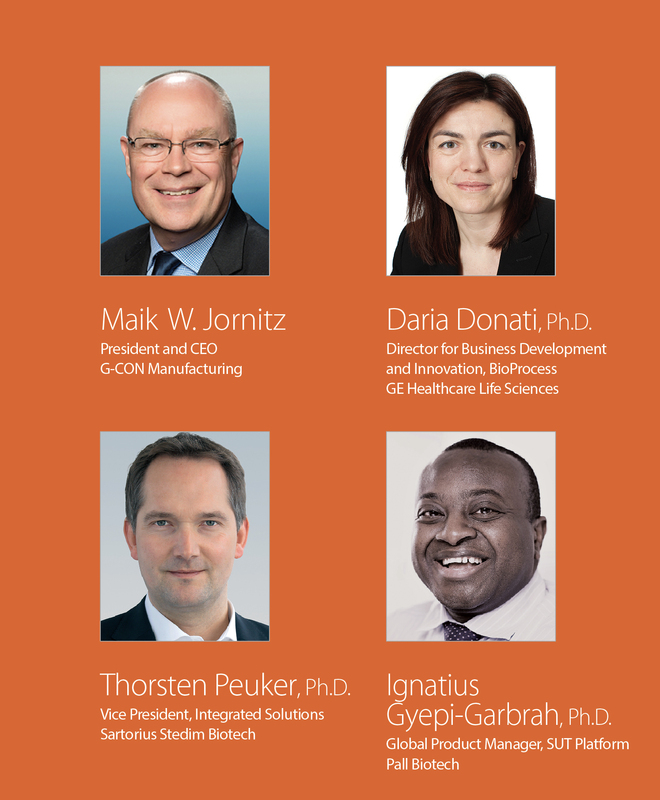 Expert panelists Maik W. Jornitz, Daria Donati, Ph.D., Thorsten Peuker, Ph.D., and Ignatius Gyepi-Garbrah, Ph.D.
GEN: When should a company commit to modular bioprocessing? What are the advantages of “going modular”? Mr. Jornitz: Modular bioprocessing should interest companies that need to expedite capacity expansions, companies that engage in multiproduct or multipurpose processing, and companies that must manufacture in-country/for-country to supply their products locally. Companies also commit to modular facility designs to delay capital investment decisions. Single-use process technology implementation is rapidly growing. 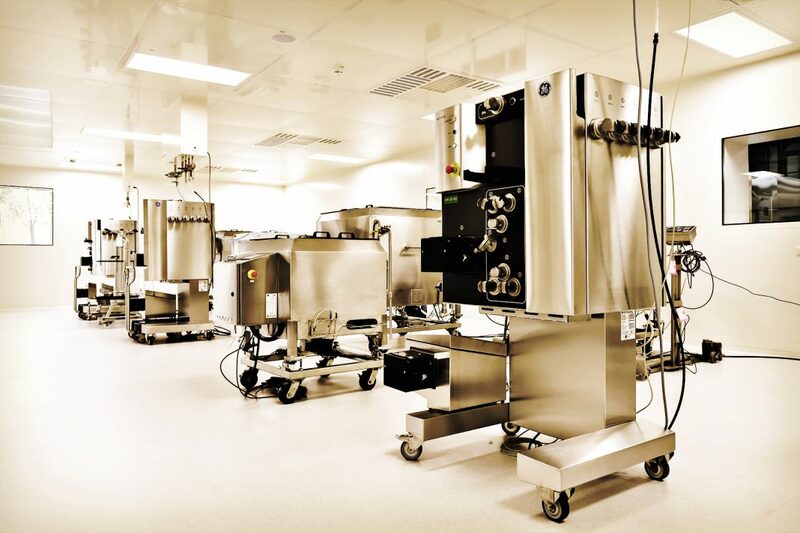 When single-use unit operations are applied in a biomanufacturing process, the surrounding cleanroom infrastructures need to become as efficient and flexible as the process equipment. Fortunately, modular or “podular” prefabricated bioprocessing cleanroom spaces are available. They can be assembled and put into use much faster than traditional infrastructures. Also, they can be reused, scaled up, or scaled down as necessary, optimizing capacity utilization. Dr. Donati: The increasingly diverse and changeable biopharma pipeline means there is a need to establish flexible and fast manufacturing capacity. Biomanufacturers already recognize that single-use technologies and modular components offer processing advantages within existing facilities. Moreover, biomanufacturers are beginning to appreciate that in some cases, the flexibility and speed of a modular approach can be extended to the facility itself. For example, in greenfield developments, newly built facilities can adopt a modular approach, which can reduce the time and costs related to biopharma capacity expansion, whether the expansion serves developing or established markets. Modular facilities accommodate production processes, not the other way around. If it is extended far enough, the modular approach may yield a turnkey solution. Dr. Gyepi-Garbrah: The industry is making significant investments into building infrastructure with new manufacturing sites (often referred to as greenfield sites) or upgrading older existing manufacturing facilities. We have been focused on how process equipment, automation, and consumables are being used, and how we can meet customer needs and challenges. Single-use technologies continue to advance modular processing. Accordingly, we continue to provide highly configurable equipment and robust manufacturing processes. Such equipment should be compatible with most applications, and such processes should integrate with standardized systems. The advantages here come from the flexibility in footprint, reduction of resources needed (no large, traditional, stainless-steel installations), as well as the ability to scale up more rapidly from clinical phase production to commercial scale. Modular bioprocessing enables production processes to be more easily optimized, and for equipment to be slotted in or removed to comply with the process requirements for different biomolecules. It is really the first time we can see the concept of “plug and play” become feasible for the bioprocessing sector. Dr. Peuker: There are four major reasons, why manufacturers should consider modular bioprocessing: 1) Fast-changing demands for biological drugs. It is much easier to react to varying market demands if modular systems/facilities are applied. They can help biomanufacturers avoid capacity shortfalls and preserve market share. 2) Time-to-market pressures. If biomanufacturing systems and facilities are standardized, it takes less than six months from concept to cGMP readiness. 3) Cost pressures. Manufacturers must significantly reduce the cost of goods sold. Smaller batch sizes enable modular, single-use manufacturing and improve total cost of ownership. 4) Flexibility requirements. Multiproduct facilities are needed to satisfy diverse and changing market demands. Changeover times can be reduced considerably by modular approaches to increase overall equipment efficiency. GEN: What are the limitations associated with modular bioprocessing? How are these best ad-dressed and overcome? Mr. Jornitz: There are two major limitations. The first concerns the size of the equipment; the second, the amount of open space. If the equipment is too large, it may not fit into the podular space. One can add a height extension on these cleanroom units, but there is definitely a limit to how much height can be added. When prefabricated cleanroom units are introduced to a building, a fair amount of open space is needed. Buildings that have many narrowly spaced columns or other potential obstructions can complicate the installation of prefabricated units. In contrast, high-span shell buildings, like Butler buildings, make it possible to “float” prefabricated units into place via air bearings so that cleanroom infrastructures can be installed within hours. Dr. Donati: When we configure KUBio, our factory-in-a-box solution, we accommodate client- and location-specific variables. These include the local climatic and seismic conditions as well as country-specific laws and regulations. At the same time, turnkey facilities such as KUBio are pre-engineered, and there are some limitations on how much the solution can be tailored without losing its key benefits, such as the defined cost and timeline from the start of the project. Dr. Gyepi-Garbrah: In modular processing, the challenges and up-front investment costs that come with traditional scale-up in fixed facilities that house stainless-steel devices are mainly eliminated. While there is still the initial cost of obtaining equipment, and the reoccurring cost of maintaining stocks of single-use consumables, the time it takes drugs to get into the market or clinical trials is drastically reduced. Biomanufacturers may focus on scaling-out (parallel processing with multiple bioreactors) instead of scaling up. Consequently, they may realize additional production efficiencies even while occupying a much smaller facility footprint. When product titers exceed >4 g/L, biomanufacturers will start to encounter complications such as increased buffer volume requirements. To handle greater quantities of drug substances, biomanufacturers may need to deploy high-performance chromatography resins and filtration membranes. Additional process costs and labor will be required to keep processes running smoothly. However, the ability to do more batches in a year levels a lot of this out; additionally, clever scheduling and a good automation platform can be helpful. Dr. Peuker: Modular bioprocessing works only if we reduce complexity. Too many of the technologies and products currently available are incompatible. Standardization is key for the future, and if this goal is to be reached, all stakeholders will have to cooperate. The automation level of today’s modular bioprocessing facilities is very low. To enjoy all the abovementioned benefits, we need to reach a level of automation that supports plug-and-play manufacturing and reduces failure rates. GEN: What are the most recent advances in modular systems? How have these improved bioprocess operations? Mr. Jornitz: New podular turnkey facility solutions will not just be available for monoclonal antibody purposes, but for a multitude of purposes, including applications such as the production of cell and gene therapies and vaccines. These turnkey solutions will compress design timelines and speed implementation. In addition, turnkey solutions can be cloned, propagating known entities and creating scaling effects. Our vision is twofold. First, standardize prefabricated containment cleanroom systems to enable delivery, potentially from a showroom, within 48 hours. Second, establish facility designs and cleanroom infrastructures that can be chosen from a catalog and refined by a virtual reality walk-through. These two approaches will create tremendous delivery and cost efficiencies. Dr. Donati: One of the most advanced developments right now is the implementation of modularity on a process level, where the development of agnostic unit operations can be operated through a plug-and-play mode through disposable connectors supported by an appropriate automation platform. From a facility perspective, modularity is welcome, but the real innovation comes from being able to develop the first facility as a turnkey solution to produce biopharmaceuticals. Besides integrating end-to-end bioprocessing manufacturing equipment in a modular facility, GE’s KUBio provides a suite of services. These services include financial guidance, project coordination, and qualification and repair services. Dr. Gyepi-Garbrah: These newer modular systems allow for a plug-and-play approach where you can add instruments or take instruments away as you need them. Particularly where manufacturers need to produce multiple products, the modular approach is easiest to move along to the next step in the process to get the most drugs through the clinic and improve the chances of getting them to market. Pall Biotech has a suite of standard, configurable instruments/platforms for upstream and downstream operations that enable turnkey operations. With standard, configurable solutions that are also scalable, there is reduced need to customize—manufacturers can have the flexibility to meet demands now and scale for the future. address concerns about higher flow rates needed in wash steps. Other areas where work remains are automation and integration. Dr. Peuker: Sartorius Stedim Biotech offers plug-and-play solutions for responding quickly to capacity demands. These solutions minimize staff requirements and changeover times, as well as satisfy regulations while covering every production stage from the receipt of raw materials to the delivery of the highest quality drug products at the lowest cost. Enhanced inline/online monitoring capabilities facilitate robust material characterization, process control, and consistent product quality. Hardware for advanced inline/online monitoring devices include indirect and multi-attribute sensors. Industry-leading software enables multivariate data analysis, predictive models, and closed feedback control loops. We actively engage in supply partnerships with our customers to help them make the best use of our technologies, hardware, software, and consumables, and provide access to both service engineers and second-level support specialists to minimize downtime.